This is our final episode about the military conflict at the front before we shift gears next episode to discuss the events around the armistice. This is something of a milestone because it is the last episode for the foreseeable future that will focus solely on military events, or at least the last about military events of what is traditionally considered the First World War. After this episode we will spend some time discussing the armistice, how it came about, why it happened, and how it was implemented. Then we will have a few episodes about the Spanish Flu, which would sweep the world in the months and years after the war, then we will have a deep dive in the incredibly confusing and incredibly large story of Versailles. But before we get there, and before our story becomes one of politicians in dusty rooms, the armies of the Western Front had one final, very large, spasm of action in the last 6 weeks of the war. This is our final episode about the military conflict at the front before we shift gears next episode to discuss the events around the armistice. This is something of a milestone because it is the last episode for the foreseeable future that will focus solely on military events, or at least the last about military events of what is traditionally considered the First World War. After this episode we will spend some time discussing the armistice, how it came about, why it happened, and how it was implemented. Then we will have a few episodes about the Spanish Flu, which would sweep the world in the months and years after the war, then we will have a deep dive in the incredibly confusing and incredibly large story of Versailles. But before we get there, and before our story becomes one of politicians in dusty rooms, the armies of the Western Front had one final, very large, spasm of action in the last 6 weeks of the war. 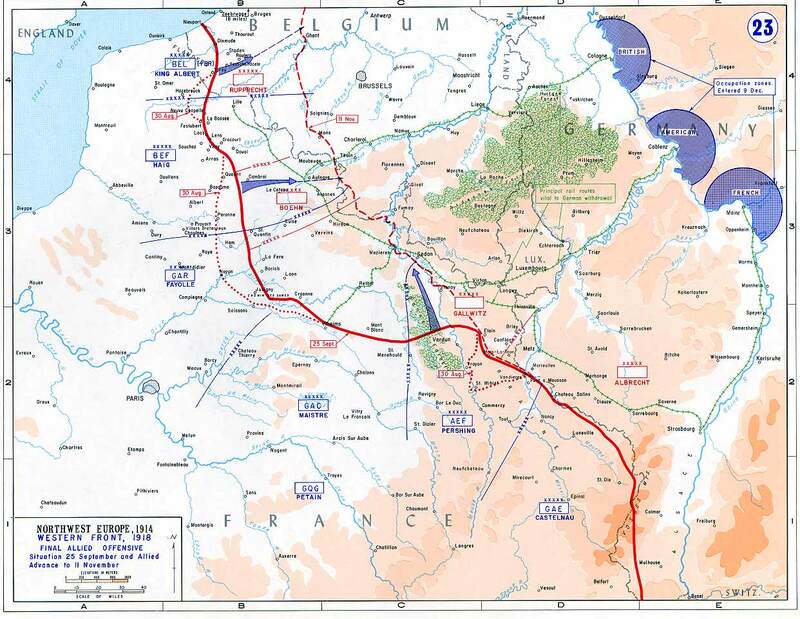 During this time the Allied general offensive of late September and early October would continue. The Germans would continue to try and find a way, any way, to slow them down. A solution to the problem would never be found, and instead the German army would instead begin to crack at the seams and the military leadership would find itself under new management. Eventually the army would be one of the primary drivers and supporters of the armistice discussions. Before we get to those last actions though we begin with two somewhat random topics. The first is about the allied usage of tanks during these late war offensives and the second is a bit of detail about what one Australian battalion did during this fighting. I know we don't dive into extreme detail very often, but looking at the actions of one unit during the 100 days allows us to make some good comparisons to earlier in the war. We will then close out this episode with discussions of the last Allied offensives of the war, and the German reactions to it. We have not really discussed the usage of tanks in these 1918 battles very much. The Germans did not use many in their offensives earlier in the war, but the French and British had been refining both the tanks themselves and how they used them since 1916. By 1918 they were being created in huge numbers, with the British manufacturing over 1,200 of them during the year. These tanks would see heavy usage during the early parts of the 100 days, especially at and immediately after Amiens. However they would once again prove that they were still not capable of maintaining any real combat effectiveness during a long campaign. The biggest problem was still one of maintenance and reliability. This would prevent the British from being able to mass large numbers of tanks over the long term since they were either breaking down or destroyed by enemy action faster than they could be manufactured. They had greatly increased the reliability with the Mark V series of tanks, but greatly increasing the reliability was not really saying much given the fact that previous reliability was so absimal. When this limited reliability was combined with the fact pace of action between August and November the number of tanks available to the army would rapidly decline. This did notmean that the tanks were not involved, basically from Amiens to the end of the war, with one 2 week break in September when they were all pulled off the line for maintenance, tanks were involved in some way in every major British and French action. They almost had to be involved since they were such a critical piece of the British and french offensive doctrine at this point. This next section of our episodes comes to your courtesy of Dr. William Westerman and his article The Real Controller of the Battle: The Importance of Studying Tactical Battalion Command -- A Case Study which I found in the Journal of Military History. Just real fast here, if you like this podcast and your like military history in general, I highly recommend heading over to smh-hq.org and checking out the Journal of Military History. For $70 a year you can become a member which gets you a physical copy of the 4 volumes of the journal for that year, but more importantly gets you digital access to the entire back catalog of articles, these reach back decades and cover all kinds of topics. Anyway, back to our story. In his article Westerman looks at the 22nd Australian Infantry battalion and its actions during the last 96 dyas of the war, from August 8th to November 11th. He follows this battalion through this phase of the war as they chase the Germans as their retreat and then through their attacks on the Hindenburg line and beyond. I found a few things interesting about the information that he discussed. The first was a breakdown of what exactly the battalion did during this time. During these 96 days the battalion would spend 5 days fighting, 7 holding the line, 3 in support, 15 moving around, 18 resting, and then 47 days training. The number that really stands out to me is the training number, I would have expected that number to be much smaller at this point in the war. But training was still important, especially since the Australians found themselves in a very different type of war in 1918. Gone were the fixed positional battles that had been the norm during 1915-1917. The Australian troops had mostly been trained and had gotten their first combat experience during this time and the shift meant moving away from everything they had learned up to that point. This was especially important for the officers who needed new training in the realities of the battlefield of 1918 which was evolving all the time. Another interesting piece of Westerman's work is his description of how the Battalion and its commander, Lieutenant Colonel Wiltshire interated with artillery during this time. Up to this point when we have discussed artillery during the war we have talked about his its rigid schedules and lack of communication between the units and the guns was a serious problem. In many cases during the last few months of the war the situationw as the exact opposite for the Australians. During these more fluid actions each battalion commander was in direct contact with a dedicated set of artillery batteries that he could use to provide fire support where and when he needed. There was also significant flexibilty for the officers when it came time to execute attacks. They were generally informed about the objectives and then what support they had and the rest was left up to them.This autonomy is interesting because it was moving the structure of the armies back to how they were envisioned before the war with unit commanders begin given flexibility and freedom to do what they needed to do. When the war started this was all forgotten as massed infantry attacks and set piece battles became the preferred method. But here at the end everything came full circle. Gone were the days of the long lines of men on the Somme advancing at specific pace at exacting times. Flexibility had returned. As the fighting entered into late October and November, the German army was wrecked. Since mid-July they had suffered 800,000 casualties, this on top of the almost 1 million that they had suffered from March to July. Divisions were skeletons of their former selves, with many down to under 1,000 men. They were heavily outnumbered in men, and in other areas it was even worse, with the Allied superiority in artillery and aircraft being completely unanswerable by the Germans. During the summer there were several small-scale mutinies among German units, often when they were preparing to move up to the front, but this would just be the beginning. With their peace note that was sent to Wilson on October 3 the leadership of Germany was already beginning to consider an end to the war, but that did not mean that the army could stop fighting, instead the fighting had to continue to the very end, but could the army sustain it? There had been a slight bump in morale when the Allied had attacked in August, with the move to the defensive bringing back something within the German soldiers, but this rise did not last, and soon morale cratered again. Desertion also began to rise, and while this would not reach huge amounts early on, it would continue to rise for the rest of the war. One of the narratives that would rise in prominence after the war was that the Germany army, and especially it soldiers, just sort of melted away and gave up during this period of the war. From a desertion perspective, while the numbers were high, it is not like the entire German army gave up. The number of Germans surrendering was high, that is true. Over the course of the entire war about 715,000 German soldiers were captured by the Allies, of that numbera bout half came in these final months of the war. This was a statistically significant increase in the number of surrenders, and officers behind the front searched for some reason for why it was happening, and maybe a way to stop it. One possible answer was the German soldiers who had been captured by the Russians and had only recently returned after the Russians had exited the war. There was concern that these soldiers had been influenced by the Bolsheviks and were spreading that influence to other German troops both behind and at the front. This had been a serious problem for the Austrians when their prisoners returned, but in Germany it probably had a negligible effect, at least on the army at the front. Speaking of troops at the front and elsewhere, often morale issues in one area of the army had a way of filtering out to the others, and nowhere was this more true than in the training camps back home. Word of the situation at the front, and that many troops at the front had completely given up on the idea of winning the war by September 1918, found its way back to the camps where new soldiers learned of it, which created this kind of compounding depression of morale, where troops would feel the effects of these negative feelings before they even reached the front. This was a worrying trend, but the most concerning situation was with the officers at the front. One soldier in the Sixth army would write in a letter home that ‘our officers have also had enough. They’re not allowed to say it openly but now and again they let it be known.’ This would create the most concerning structural problem for the Germany army in the last weeks of the war. Having a few enlisted men surrender here or there was a problem, but a manageable one. Having officers get involved with those surrenders was something very different. The belief in the German units was that if an officer organized a surrender then there was a much greater chance that the enemy would recognize the surrender, instead of just killing them. There was never widespread reports of Allied soldiers killing Germans who were trying to surrender, but it is true that it was probably easier to organize a surrender when officers were involved. These types of actions were not typical, but they certainly happened. There is one story of a German officer who crawled across no-man's-land late in the war and surrendered himself to the British. His one request after he surrendered was that he be allowed to return to his lines to that he could bring over his men as well, a request that was granted. These types of stories are probably the best example of poor morale that I can give, once the officers in an army starte completely losing faith it is hard to keep the army together. Not every officer had given up those, and many were still fighting, with their men, and they would continue fighting until the very end. In early October the Allied commanders once again met to decide their next course of action. They all knew that there would be more attacks, the only question was when, where and by whome. There had been an overall slowing of the allied advances during the first day s of October as each of the previous attacks that had begun in late September had reached their limits. In Flanders they were stopped as much by weather and rain as by German resistance. In the Meuse-Argonne the Americans just were not doing very well. In other attacks there were supply problems that were beginning to slow down the troops. The goal waso to make sure these efforts were restarted and continued in mid-October. Haig was on board with this plan, 100%, he believed that the German army was basically beaten and that attacks would run into little resistance as they advanced. Foch agreed with this assessment and on October 10th he would order a new set of 3 attacks. In Flanders the Allies would drive forward from their gains around Passchendaele with the objective to push toward Ghent. The British would also attack toward Mauberge from their positions around Cambrai. The French and Americans would also continue their attacks in the Meuse-Argonne with the objective being Mezieres. In the Meuse-Argonne the Americans had paused their offensive in early October after having so many problems during the first week of their efforts. Thsi allowed the Germans to also recover and so when the attack restarted they initially experienced little success. This greatly frustrated the other Allied leaders, with Clemenceau apparently being furious at Foch for not taking the Americans in hand and pushing them harder. It would not be until October 14th that real progress would begin to be made. it was on that day, and the days after, as other attacks began elsewhere along the front that the Americans would really start to push through the German defenses. Even this did not raise the evaluation of the other Allied leaders, they were still convinced that the Americans had completely botched the situation. They had massive numbers of men, they had been facing what could not have possible been the best German troops, and it still took them weeks to accomplish anything, it was not a good look. Elsewhere on the front things were going much better for the Allies. In Flanders, when the attack began on October 14th, they found that the German troops almost melted away in front of them, with no small number surrendering to the advancing troops. This resulted in an attack that advanced faster than anyone had expected. 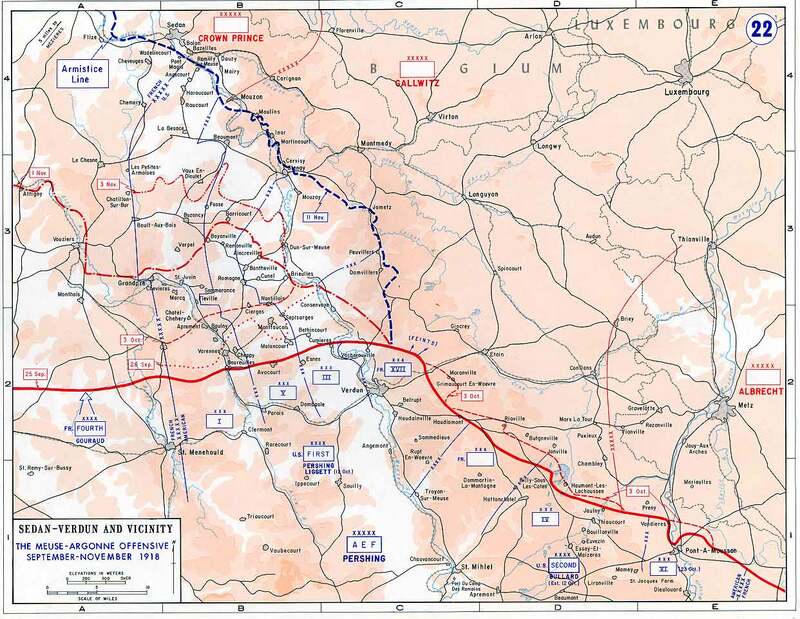 With resisistance completely falling apart on this sector of the front the German troops to the north began to become concerned and requested that they be allowed to retreat. These troops were at this point the furthest into Allied territory and more importantly to their north was the North Sea and to their south was the growing Allied salient in Flanders. If they did not begin moving soon it was likely they would be cut off. On the 15th Ludendorff authorized them to begin a general retreat. This allowed the Allies to push along the cost, overruning the ports of Ostend, Zeebrugge, and Bruges. This finally put the German U-Boat bases in these ports out of action, a goal for the British since early 1917, and the U-Boats were sailed back to Germany. To the south around Cambrai the British, with a bit of American help, would attack on the 17th and over the next week they would push forward. All along these attacks the Germans were pushed out of defensive position after defensive position. Things were going well for the Allied armies, and for the French this was something of a blessing. Up to this point the Western Front, or at least the active portion of the front between the Meuse and the Sea had been a giant bulge that had pushed out into France. Now, with the allies advancing this bulge began to shrink. The French armies that were in the middle allowed their portion of the front to shrink precipitously. over the 100 days the area of the front that they mainned sharnk from 150 miles to just 42. This allowed them to remove 3 entire French armies from the line, some were shifted other parts of the front, others were just allowed to rest. This was a boon for the manpower strapped French. Even with the Germans possibly looking for peace terms, and we will dig into the reactions to this note among Allied commanders next episode. The Allied military leadership were determined not to slow down their attacks while they waited for the armistice to take effect. In the last days of October and early November their next set of attacks began. The troops in Flanders would once again advance, this time all the way to the River Scheldt. To their south the Canadians would push forward and capture the city of Valenciennes, which was important if only because it was the last large French town that was under German control. On November 1st the American and French troops in the Meuse-Argonne finally broke through and were advancing. 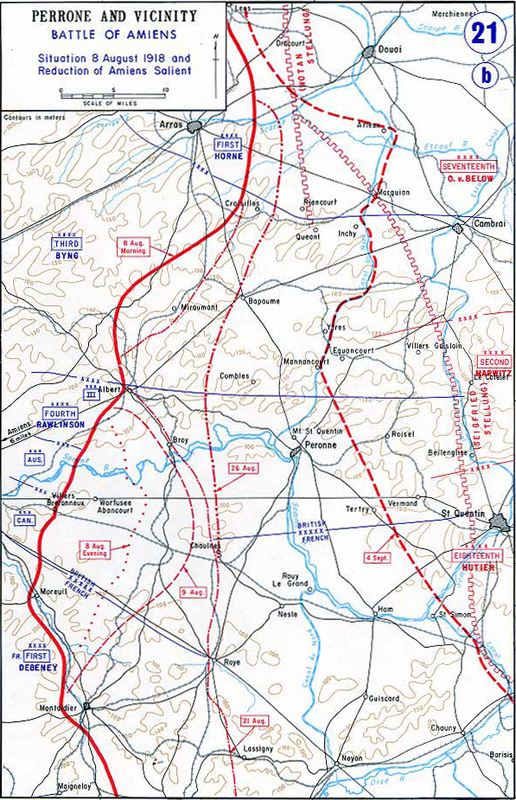 The Hermmann line would fall apart almost instantly, and the Germans were forced to move their forces back to the Antwerp-Meuse line, but they knew that this would also not last very long either. Foch and the French were already preparing for their next set of attacks. These would be in the south, in Lorraine, an area of the front that had not seem large action in eyars. Here they would use some of the troops freed by the shrinking front to launch an attack toward Morhange, where some of the first fighting on the Western Front had occurred way back in 1914. This attack would have begun on November 14th, but it would never happen. While the military situation at the front was a disaster for the Germans that disaster was also beginning to take root back home. On October 22nd, Admiral Hipper tried to start Operation Plan 19, which was essentially a suicidal naval mission where the German High seas fleet would sortie out of their bases and seek to engage the British fleet whereever they were found. As soon as the sailors found out about the plan they mutinied and raised the red flags of revolution. They were joined in this revolt by the army units within Kiel. Germany, like Russia before it, was on the brink of revolution, the war had to end, and it had to end quickly if the German state was going to survive. That will be our story next episode as we look at how and why the armistice was finally put in place. The war would be over soon, and then everyone would have to figure out what was going to happen after.